In 2016, all of the DIA Group countries presented positive growth in gross sales under banner, reaching up to EUR10.500bn, supported primarily by sustained price investment and improvement in customer services. Adjusted EBITDA, at constant currency, improved by 8.6% in 2016, with respective growth rates of 1.4% and 41.9% in Iberia and the emerging markets. In turn, comparable consolidated sales in 2016 increased by 8.7%, a record high for the company since it started trading on the stock market in 2011. The adjusted EBITDA margin was 7%, representing an improvement of 21 basis points, as a result of improved evolution of costs, purchasing synergies and the positive impact achieved through economies of scale in emerging markets (Brazil, Argentina and China). Depreciation and amortization increased by 8.6% during the year, to EUR232.4m, a figure that percentage-wise is above the sales growth rate, due to recent acquisitions and, to a lesser extent, the refurbishment projects carried out during the financial year. Adjusted EBIT declined slightly by 0.9%, to EUR392.7m, representing an improvement of 5.8% at constant currency. This result implies an adjusted EBIT margin of 4.4%, remaining stable with respect to 2015. Non-recurring items decreased by 19.9% to EUR97.7m, while accrued expenses relating to the long-term incentive plan for Directors reached EUR15.2m in 2016. The non-recurring items representing cash outflow decreased by 22.6%, to EUR73m. EBIT improved by 7.6%, reaching EUR295.1m, representing an increase of 15.5% at constant currency. In spite of the interest rate hike in Argentina and Brazil, consolidated financial expenses decreased by 7.1% in 2016, to EUR52m. In turn, the total cost of factoring activity made by the company during the financial year amounted to EUR0.14m. 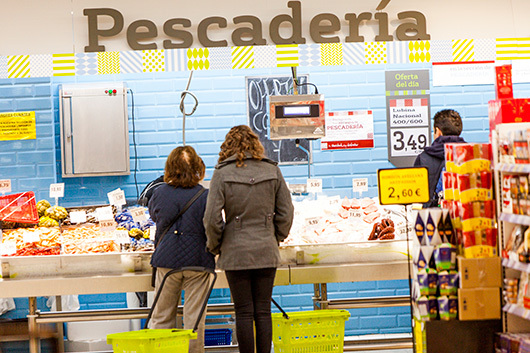 In local currency, net sales fell by 0.6% in euros to EUR8,868m, due entirely to the adverse effect of the greater weight of the network of franchise stores on net sales. At constant currency, net sales growth during the year stood at 9%. Currency depreciation in 2016 had a negative impact of 9.7% on net sales growth, although the performance was stable in the last part of the year, particularly in the case of the Brazilian Real. Taxes recorded in the year amounted to EUR69.1m, representing an effective tax rate of 28.4% in 2016. Attributable net income decreased by 41.8% to EUR174m, due to the recognition of deferred tax assets of EUR140.4m last year, coming from negative tax bases of the El Árbol banner. Excluding these exceptional impacts, the adjusted net result of the company improved 1.8%, reaching EUR258.6m in 2016, which represents growth at constant currency of 3.9%. (1) Adjusted for non-recurring items. DIA’s negative operating working capital increased by 39.1% in euros to EUR1.022bn, while at constant currency growth it was 38.7%. The value of inventories was 19.0% higher than the level recorded last year (17.3% at constant currency). 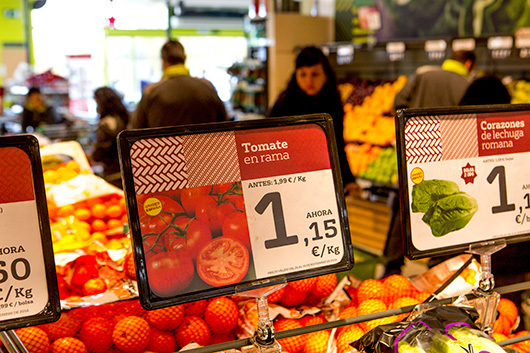 This growth is due to the expansion of the product range, the company’s efforts to reduce the level of in-store shortages, and the impact caused by the opening of new regions in Brazil. Trade and other accounts receivable of the Group increased by 17.9% in 2016, 16.4% at constant currency. This increase is partly due to the increase in the franchise business. In 2016, three-quarters of the increase in the value of stocks and of trade and other accounts receivable came from the emerging markets segment. In 2016, DIA showed its commitment to the franchise concept by granting additional financing to its franchise network. Total net exposure to loans granted to franchisees was EUR106m euros at the end of 2016, bearing in mind that part of the risk is covered by guarantees and pledges. This involves a highly diversified credit risk, as it is fully distributed among the 3,363 franchisees which, at the end of 2016, operated 3,969 DIA franchise stores. Moreover, default levels improved substantially during 2016. Trade and other accounts payable increased 28.6% to EUR 1,953 M, an increase of 27.5% at constant currency. In turn, the amount of factoring without recourse to suppliers recorded in December 2016 was EUR88.4m. The number of days of negative operating working capital (calculated on the basis of sales costs) increased by 15.5 to 53.8 in 2016. This change could have been reduced by 10.9 days (to 49.1) in the absence of factoring activities undertaken to improve working capital management. DIA invested a total of EUR345.4m in 2016, 5.7% less than the previous year, after excluding the investments associated with the purchase of Eroski assets. In Iberia, capital invested increased by 22% to EUR225.8m. The refurbishment activities of the Maxi and La Plaza DIA formats continued throughout the year, although openings represented nearly 25% of the total investment in this area. In 2016, DIA capitalized EUR25m in Iberia in stores and logistics equipment that was previously operated under operating lease contracts. As for Emerging Markets, the investment made was reduced by 34% in euros (15.8% in local currency). Investment levels decreased in all countries in this segment, although particularly in Argentina, due to the demanding comparative base in 2015, where the company made a significant investment effort. New openings represented half of the investments made in Brazil and Argentina. Over the last three years, DIA invested a total of EUR445m between Brazil, Argentina, and China. Net debt at December 2016 reached EUR878m, representing a decrease of EUR254m compared to the previous year. In 2016, the Company invested EUR19.9m in the acquisition of own shares linked to commitments acquired under the 2016-18 long-term incentive plan. In addition, in July, the company distributed EUR122m in dividends among its shareholders. The net debt/adjusted EBITDA ratio generated during the last twelve months was 1.4x, while the adjusted figure for capitalized rents estimated by DIA, calculated on the basis of S&P methodology, remained at 2.1-2.2x versus the 2.5x seen in 2015. Both ratios allow for additional margin leverage without jeopardizing the investment grade rating granted by the credit rating agencies. 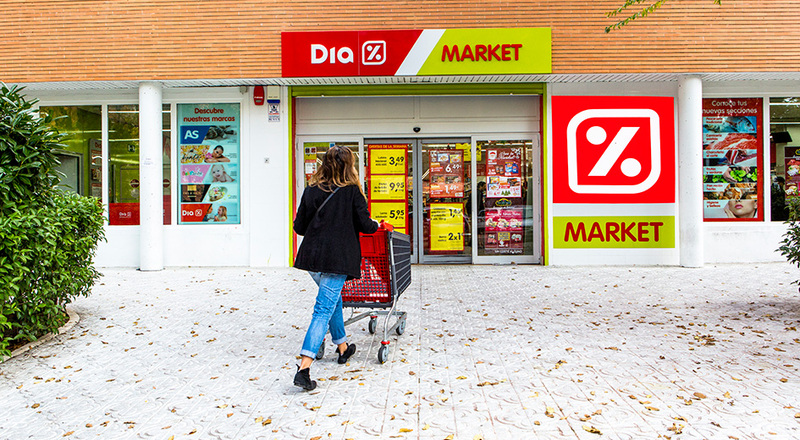 In 2016, DIA recorded EUR38.5m from the sale of assets, mainly resulting from the sale of a group of stores carried out in the last quarter of the year.